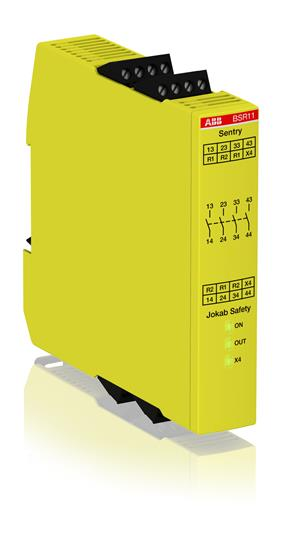 SSR42 is a safety relay with relay outputs, 2 NO + 2 delayed NO, and a +24 VDC supply voltage. SSR42 is used with safety devices with contacts, 1 or 2 channels , and safety devices with OSSD outputs. The two delayed NO relay outputs have an OFF-delay time of 1,5 seconds.